The parents of lifelong equestrienne, Cara Barker Yellott, like to tell the story of how their daughter started asking for a horse at about the same time she actually learned to talk. In an effort to dodge the issue, her father promised to get her one when she was ten years old. No doubt he felt certain that by that age, she’d have lost interest. Fast forward to age ten and Cara had most certainly NOT forgotten, so riding lessons were started as a birthday and present and when her tired old lesson horse was put up for sale later that year, Daddy’s promise was kept. Through her teenage years, Cara was very active in 4-H horse activities, proving wrong the many people who predicted that she’d forget about horses when she grew old enough to take an interest in boys. (Years later, she married the first man to buy her a Shetland Pony and prove his love by helping to repair fences!) While still in high school, she started giving riding lessons and still counts some of her early students, who have now grown into adults, among her dearest friends. Cara’s experience in the horse world has been extensive and varied. 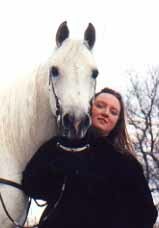 She has studied the methods, frequently under the direct tutelage, of some of the top trainers in the horse industry. John Lyons, Kenny Harlow, Linda Tellington-Jones, and Sally Swift are just a few. She attended classes in Equine Management at Michigan State University and has completed a course in equine reproduction with Jos Mottershead, considered to be a foremost authority in the field. She and her students have competed successfully at many levels and she has also judged, giving her perspective on the show world from both angles. Cara says: “An elderly breeder once told me: ‘You’ll be amazed at where Arabian horses will take you.’ and I’ve found this to be very true in my life.” She’s been onstage in an opera for the United States debut of the great blind opera star, Andrea Bocelli, who entered riding a horse trained and handled by Cara! The event appeared on television’s 20/20! Three horses trained by Cara (one with a scant 30 days under saddle) were requested by the Michigan Renaissance Festival to carry their king and queen (inexperienced riders) in parades where the horses were subjected to drums, banners, bagpipes, and crowds of up to 24,000 people daily! Cara strongly beleives that with a gentle hand, your horse can be trained to do more than you ever thought possible. Now living in the Dallas/Ft. Worth area, Cara specializes in helping riders and their horses to build confidence and achieve their goals in horsemanship and in life.